Nominations must be received by June 13, 2018. Thank you. John Porter will be back in Part II of his series on Antique Barns, Wednesday May 9, 7 PM. New Hampshire barns and there will be an illustrated Power Point talk showing various features of old New Hampshire barns. This will include many things we take for granted when describing old barns like: cupolas, cow stables, hay forks, barn bridges, built-in accessories, scuttle holes, etc. On Thursday May 17th at 3:30pm the Josiah Carpenter Library, 41 Main Street, Pittsfield, NH will host a poetry reading to commemorate the publication of Maureen Van Horn’s poetry volume Fly Falls in Milk Jug: News in Haiku. The reading will feature Maureen’s work; in addition local poets are invited to attend and read their poems. A lifelong poet, in 2015 (which was her ninetieth year), Maureen began submitting commentary about current events in the format of haiku to the Concord Monitor newspaper. Fly Falls in Milk Jug collects a portion of the published haikus. Maureen served as a respected, and beloved, director of the Josiah Carpenter Library; she is a lover for the arts and finds small town life to be very rewarding. Please come and enjoy an afternoon of poetry, refreshments will be served. It was a long winter and I believe we are all quite ready for Spring and Sunshine. With that said, the folks who are carrying on the hanging basket tradition, started by John Lenaerts over 15 years ago, have ordered the flowers and begun preparations so that our town can be graced with overhead 'flower power' once again this year! If you enjoy looking up and seeing the flowers, would you consider making a donation? Each year our flower angels plant and hang 40+ baskets, your donation, no matter how much, will help cover the cost of the flowers, soil, fertilizer and maintenance of the flower power watering cart! Speaking of the cart, you will see these lovely flowers being watered every-day by tireless, devoted volunteers - this undertaking would not happen without our 'watering angels'. 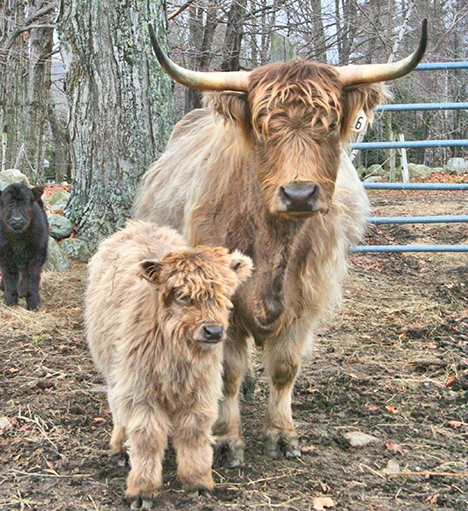 ​A manure producing machine called Kelsie the cow with her calf. The caller spoke with a slight twang, perhaps a Southern accent? “How much would a truckload of composted cow manure cost? I need it for my lawn”, he asked. He liked the price I quoted and then asked where we were located. The caller didn't seem to recognize Loudon, and when I asked his location he said, “Boulder...Colorado!” After a few laughs about a 2000-mile delivery charge, we hung up. Manure is a recurring consequence on any livestock farm. If handled responsibly, it's future soil and composted cow manure is gold for gardeners. Cattle are manure factories; 80% of what they eat returns to the earth as dung. Managing those cow chips is an essential factor in farming. Summer management is effortless. The cows graze, drink water, pee and poo. When using rotational grazing methods, this natural fertilizer is spread evenly on fields to nourish the grass the cows eat. The management challenge occurs in Winter when the cattle are fed hay because there is no grass to graze. We provide hay in feeders as well as on the ground, and in the Feed Bunker. During the Winter we relocate the hay feeders around the pasture and as the feeders move, so does the manure. It’s the same with feeding hay on the ground. If a particular patch of a field needs extra nutrients, we'll plop a round bale (800 pounds) on the ground, and the next day the hay will be gone leaving bits of uneaten feed and manure to fertilize the bare spot. Managing the Feed Bunker takes more effort. The cattle stand on a concrete pad outside the bunker and reach in to eat hay. Muck builds up where they loaf and has to be removed. Fortunately, several years ago, USDA (United States Dept. of Agriculture) via the EQIP (Environmental Quality Incentive Program) provided cost-share funds to build a manure pit behind the Feed Bunker. Periodically, we use the “Bobcat” or tractor to scrape the accumulated cow plops into the pit. In Spring we provide composted manure for gardens and lawns. Sometimes folks take it away in their pickup trucks. Sometimes we make arrangements for dump truck delivery. While we've transported to Gilmanton and Concord, we have never trekked to Colorado, and I'm guessing we never will. Thought they had cows in Colorado! Meanwhile, the six-little-piggy drama continues. Just under a week after I moved them to the pig house, they stopped eating so I moved them into what I call “intensive care”; also known as the farmhouse hallway. The hallway is tiled (for easy cleaning) and heated so now I can conveniently feed them five or six times a day. After several feedings of electrolytes, they all recovered and will live in the house until they are eating solid food. Of course, the hallway is now a pig pen… literally… so I hope they learn how to eat pig food soon! You are invited to stop by and see these six-little-squigglies as they grow into three hundred-pound hogs. On Saturday you can visit with the piglets, currently eight-pounds each, and our nine new calves as well as Angus The Rabbit, and House Pig Tazzy, who loves visitors....especially if you feed her carrots. Planning a yard sale soon? Would you like the benefits of having it the same day as many of your neighbors and having it inexpensively advertised? The Greater Pittsfield Chamber of Commerce, which includes Barnstead, Chichester, Epsom, Gilmanton, Loudon, Northwood and Pittsfield, is sponsoring our 21st Annual Multi-Town Yard Sale. The advertised times will be from 8 a.m. till 2 p.m., Friday, Saturday and Sunday, June 1rst, 2nd and 3rd. Participants choose if they participate one, two or all three days. We do our best to designate this in the Yard Sale listings. Those wishing to hold yard sales/barn sales/garage sales at their home or business on this weekend, may register the address of their sale to be included in an online map and printable address list. Individual registration is a modest $5 to help cover advertising costs. Group or Multifamily locations pay a $10 registration fee, and have an enhanced listing. As always, the registration fee is waived for non profits. Donations to the Banner project (in Pittsfield) are always welcome for those wishing to add a few dollars to their registration. Again this year, there is a community yard sale location at Dustin Park on Saturday June 2nd, 8am-2pm. You must register to set up in Dustin Park. The same $5 registration fee applies. Anyone may register for the Dustin Park location regardless of their hometown. Set up will begin at 6:30 a.m., and all items must be cleared from your designated space by 3pm. Restrooms will be available for those registered. Any address in the seven member towns listed above may register their yard sale. Registration forms are available in The Suncook Valley Sun and online at www.pittsfieldchamber.org and mailed to the Chamber at GPCOC, PO Box 234, Pittsfield, NH 03234. Our state’s over-reliance on local property taxes to support public schools disadvantages Pittsfield’s students and other New Hampshire students who live in towns that are often referred to as “property-poor” towns, towns with limited ability to support its students. In multiple rulings, the New Hampshire Supreme Court has clearly affirmed the state’s responsibility to support public education. But in reality, the state has provided little to no relief for taxpayers and continued inequity for our children and youth: the unequal playing field that has been long established continues to be maintained. The well-known Claremont Lawsuit and its successors was expected to remedy this problem, but in fact has not done so. In fact, the recent elimination of stabilization grants to property-poor towns has worsened the inequity. The state’s negligence has been well documented in an analysis conducted by the former New Hampshire Center for Public Policy Studies issued in June 2017: http://www.nhpolicy.org/report/ education-finance-in-new-hampshire-headed-to-a-rural-crisis. The result of this inequity has resulted in sky-high tax rates for Pittsfield and other property-poor towns and the limiting of opportunities for Pittsfield’s students. The Pittsfield School Board has recently eliminated teaching and support positions at both schools which increase class sizes and cut out such positions as foreign language teacher and technology education (shop) teacher. At its meeting of April 19, the Pittsfield School Board discussed school funding with Attorney Andru Volinsky, the lead attorney in the Claremont Lawsuit. The Board is in the process of evaluating options regarding this very frustrating situation. To assist in this decision-making process, Attorney Volinsky will be providing a workshop on New Hampshire school funding, to which all Pittsfield citizens are invited. This workshop will be held at 6:00 p.m. on Wednesday, June 13, at PMHS. Pittsfield residents are invited and encouraged to enter into this very important conversation. Please give your participation your most serious consideration. Home gardeners will find inspiration at Catamount Womenaid’s 4th annual Spring Plant Sale on Saturday May 19 from 9 to 3 at the Lily Inn on Route 4 in Epsom. Hundreds of healthy perennials and annuals in dozens of varieties —all donated by local gardeners and nurseries—will be ready for planting into home gardens. All proceeds benefit Catamount Womenaid , a local nonprofit organization that provides emergency financial assistance to our neighbors in Deerfield, Epsom, Northwood, Pittsfield and Strafford. See catamountwomenaid.org. Home gardeners working this spring dividing perennials or propagating plants are encouraged to donate plants to the sale. Email catamountwomenaid@gmail.com to have your plants picked up. The Lily Inn is at 1740 Dover Road (Route 4), Epsom. This is the purple house on the hill across from Black Hall Road. The future of our school has me worried. It's been two years of under funding our school, in a row. Next year the State will give us less. The voters will vote a default budget. The taxes will go up and people will still blame the school. I wonder how we are going to attract or retains teachers when we don't give them the budget to do their jobs. There is a guy who was in the Concord Monitor talking about how the schools need to take the State to court to get some relief. But he can't do it alone from his kitchen table. Well, the school sure can't pay anything. I think people who care about education might contribute to a lawsuit. I know it's not much, but I could contribute $50.00 per month toward this effort. Where should I sent it? I don't want the school to suffer like what happened to our police department. I am totally incensed our police department has been ORDERED by our selectmen to close its doors 20 hours per week!!! No money in the budget? Applesauce! Financial irresponsibility from our selectmen's office, again? Our town needs a full-time police department to protect us and our interests. As for our library, a certain gentleman in town donated this land and barn for a specific reason to the library. Any money garnered should be used for that purpose and nothing else. A bigger library - who is going to protect it those 20 hours per week? A large part of our financial woes is due to our pathetic school system and its out-of-control spending! The school submitted many, many letters to The Sun as to how well the system is educating our children; and used subtle references as "scare" tactics to pass their budget. Where are those letters now? Too busy spending our money, or what? And who will be there to protect our "better educated" children when the police department is closed??? Safety should be our first priority! One more thing - I am sick of reading about cows every week, when I cannot even read about what is really going on in our town, especially financially. I grew up on a working farm and highly respect the hard work and dedication it requires to operate one. These people deserve our praise, but we also deserve more input on how the "town" is spending OUR money!!! 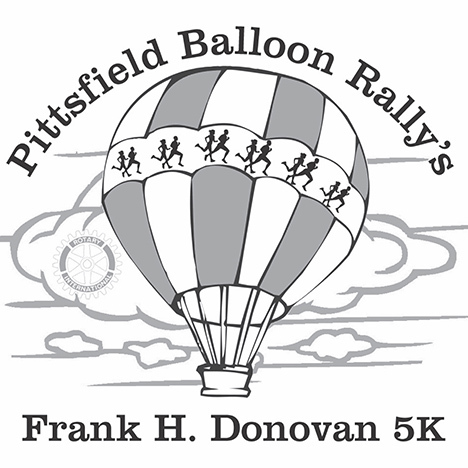 Save the date for Pittsfield Balloon Rally's Frank H. Donovan 5K, Sunday, August 5th at 9am! Registration is open at lightboxreg.com. 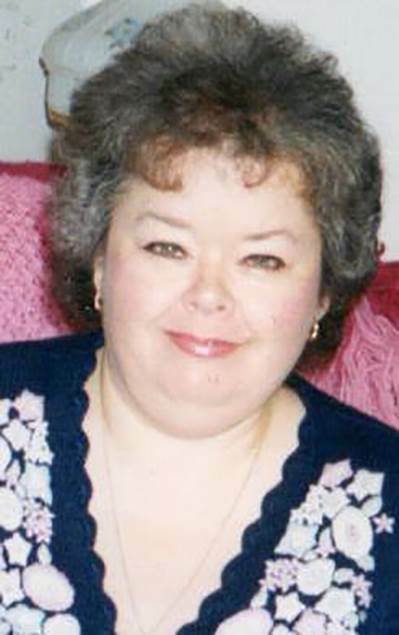 Sandra M. Kirkpatrick, age 72, of Stockbridge Corner Road in Alton, died April 26, 2018 at home, surrounded by her loving family. Born May 1, 1945 in Montreal, Canada, the daughter of Francis A. and Theresa R. (Lizotte) Rees, they moved to the United States of America when she was 6 years old. Sandy was a graduate of Turners Falls High School in MA, Class of 1963. She came from Greenfield, MA and resided in Alton, NH since 1978. Sandy worked for 23 years at Globe Manufacturing in Pittsfield, NH as a stitcher. She enjoyed reading, watching HGTV and listening to Jimmy Buffett. Her dogs meant the world to her, including Mactavish, Thor, Dugan, Tailer and Bear, predeceased by them, she leaves Murphy and Hooligan behind. They will all be together at the “Rainbow Bridge”. Survived by her husband of 43 years: Douglas Kirkpatrick and 3 children: Randy and wife Jill Foster of Pittsfield, NH, Donna and husband Mike Grant of Milton, NH and Barry Foster, 5 grandchildren: Amanda and David Grant, Randy, Nathan Douglas and Brandon and 2 great grandchildren, her brother Ricky and wife Emy Rees and family Jason, Alice and Max Mersmann. Predeceased by her son David Foster. Theresa S. Riel peacefully passed away at Concord Regional VNA Hospice House on Monday April 30th, 2018 after a lengthy battle with Alzheimer's. Theresa was born in Pittsfield, NH and was a life-long resident until 2012 when she and her husband Paul moved to reside with their daughter Debi and her husband Mick for several years in Loudon. She graduated from Pittsfield High School and took great pride in never missing a day of school in those 12 years. Throughout her working career, Theresa was employed at Blue Cross-Blue Shield and the NH Board of Underwriters in Concord NH. She also worked for Pittsfield Medical Center for 19 years. Her devotion to her co-workers and patients was immeasurable. She once skated two miles to work during an ice storm to make sure someone greeted those coming to work or keeping their appointment. Theresa was a member of the Pittsfield Fireman's Auxiliary for 27 years and enjoyed being on the Pittsfield Beautification and Historical society. She was always willing to step in as a care-giver to relatives and friends whenever the need. She is survived by her husband of 68 years Paul Riel, their daughter Debi Mulkhey and her husband Mick of Loudon; their son David Riel and his wife Jenette of Piedmont NH. She leaves 7 grandchildren and 12 great-grandchildren, all of whom loved her as much as she loved them. Graveside services will be held Friday May 11th at 10am at the Floral Park Cemetery, 30 Barnstead Road in Pittsfield NH. A reception will be held immediately following the service at the Snow Shakers Club House on Clough Pond Road in Loudon NH. 03301 or Pittsfield Beautification Committee, attn. Diana Levesque 85 Main St., Pittsfield NH.